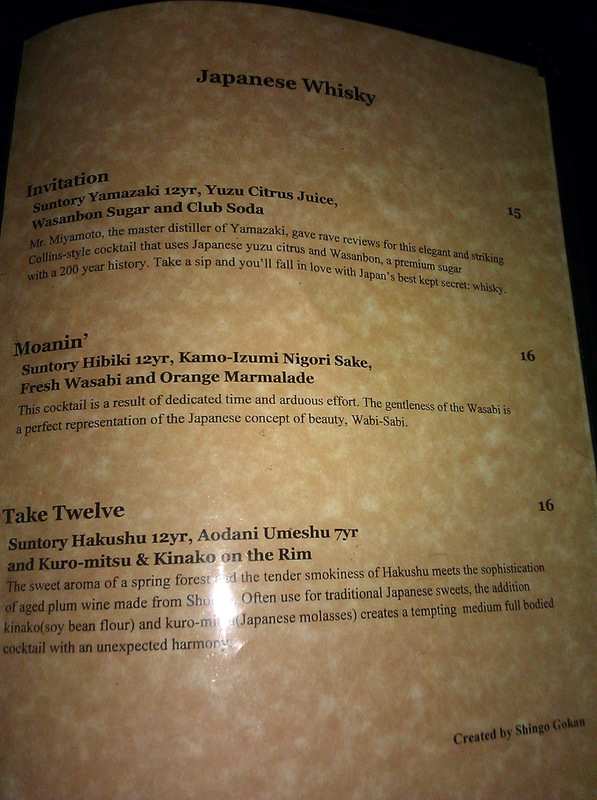 In my latest travels I visited Angel’s Share in New York City, which is a brilliant and elegant Japanese craft cocktail bar. The phrase “angel’s share”, as I am sure we are all aware, refers to the portion of scotch whiskey which evaporates over the course of barrel aging, and which fills the air in the storage facility with alcohol and with aromas of peat. Indeed, the workers in such facilities must take care to limit their exposure, lest they become drunk by absorbing the alcohol through their skin, or so I have heard. I am not going to look it up just no, so even if it isn’t true, it’s still a great story, and I encourage you to spread it. Angel’s Share is a cozy, intimate venue, and the mixologists who work there are truly artists. In stark contrast to the tasteful classicism of the Pegu Club, every single drink at Angel’s Share is unique, original, and modern. Long-time readers will no doubt be familiar with hunger for novelty in this arena, and it is a true joy to visit a bar which presses to the forefront of the craft, rather than basking in the comfort of the venerable. Their menu is superb, not only for the quality of the recipes, but because the bartenders are kind enough to write a small blurb describing their thought process for each drink. 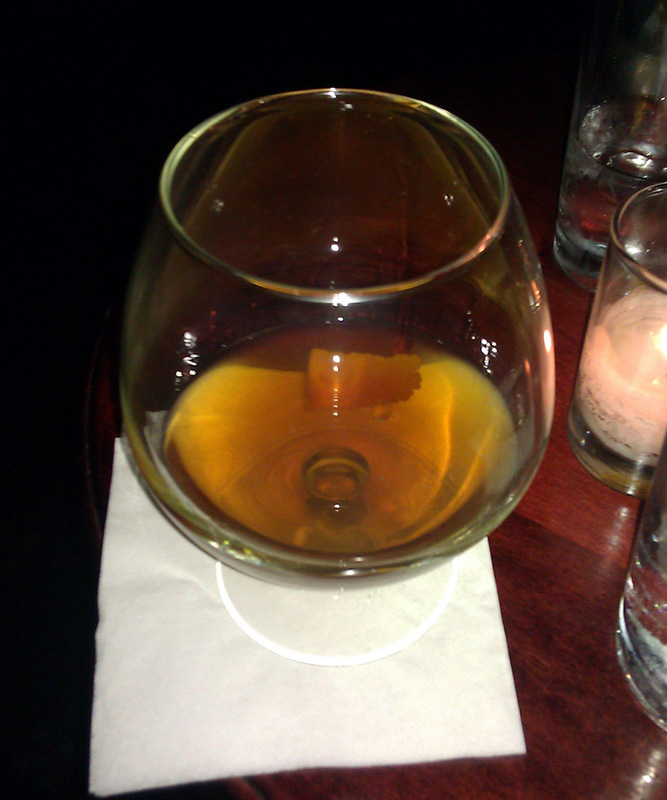 The best drink I had was a mixture of Rye, sherry, bitters, and benedictine served in a snifter which had been previously filled with smoldering (and thus smoking) cinnamon bark, and garnished with a Lagavulin-soaked lemon peel. The presentation was marvelous. The waiter brought an overturned snifter to the table, covering a plate which contained the smoldering cinnamon, and then returned with the drinks of the other members of my party. Thereafter he decanted my drink into the snifter, and with a pair of tongs, rubbed the scotch-soaked peel around the inside of the snifter before dropping it in. The smokiness of the scotch accent, and the cinnamon notes of the benedictine were divine in concert with the burned cinnamon flavor of the smoke. 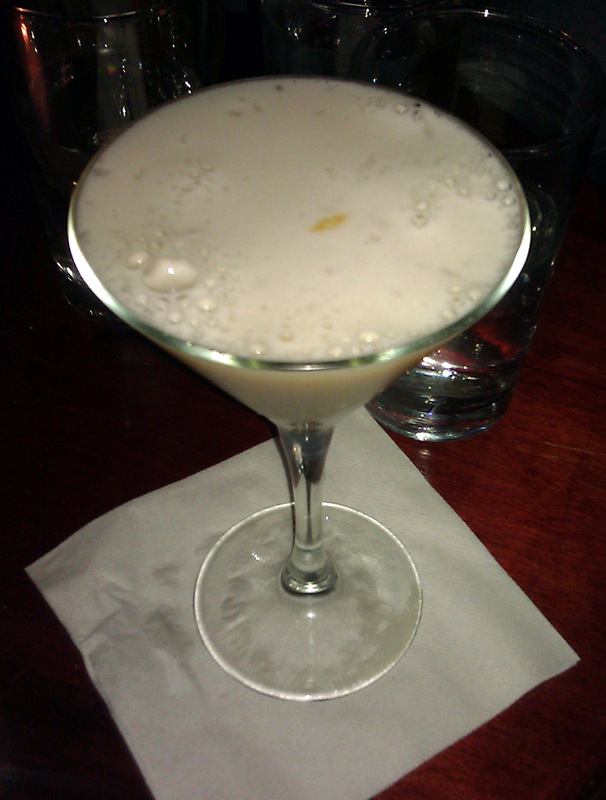 My friend anthony ordered this ingenious blend of Bacardi 8, soy milk, rice-koji jam, and shoyu. The saltiness of the drink was very subtle, and the soy milk was heavily frothed, no doubt from a dry shake. The real triumph of this drink was the synergy between soy milk and soy sauce. That should not come as a surprise, but it did. 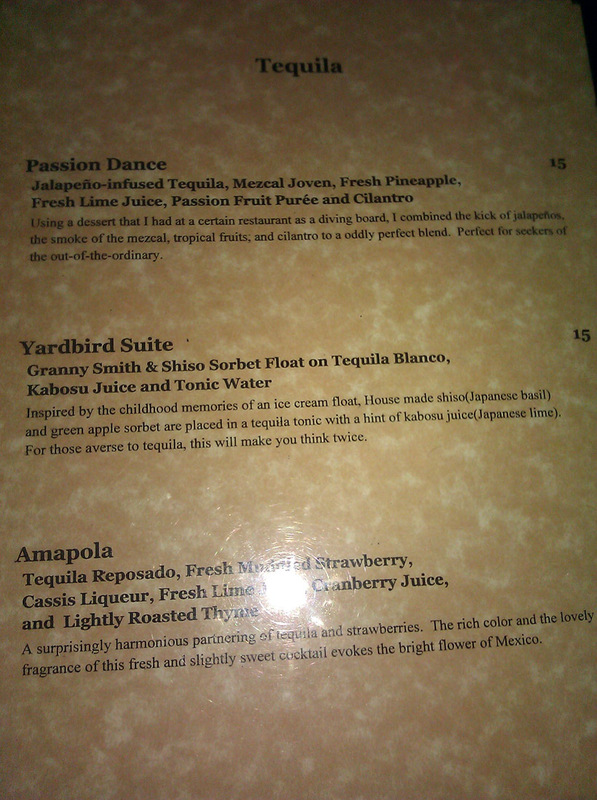 For my final drink of the night, I ordered this drink with passion fruit, mezcal, and jalapeno-infused tequila. I had recently been playing with the combination of passion fruit and mezcal, and so I was very excited to try this take on it. 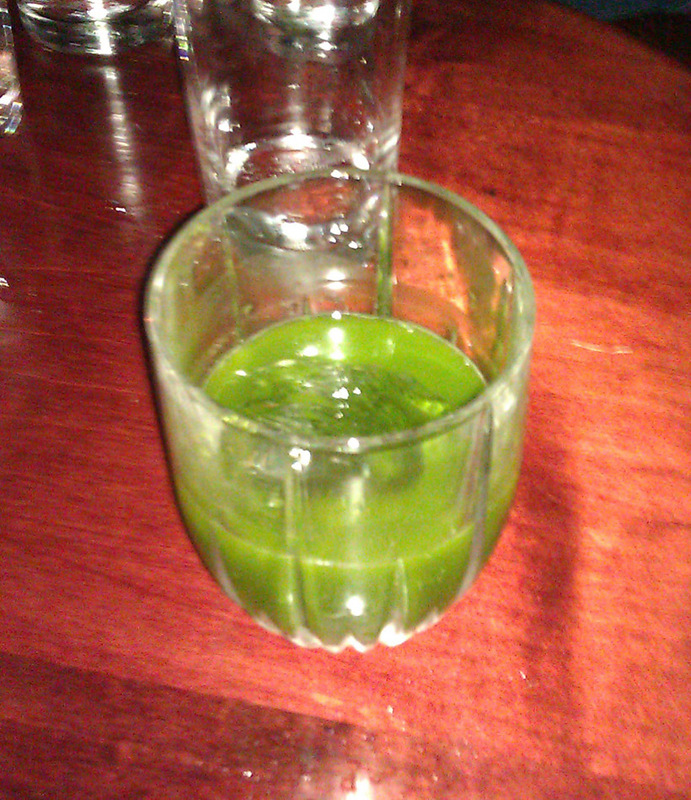 The drink came in a huge, heavy crystal goblet, with a single large ice cube and a sprig of cilantro for garnish. As we have recently explored the assonance between tequila and cilantro, I was glad to see that I am not the only one who appreciates this combination. This drink was phenomenal. 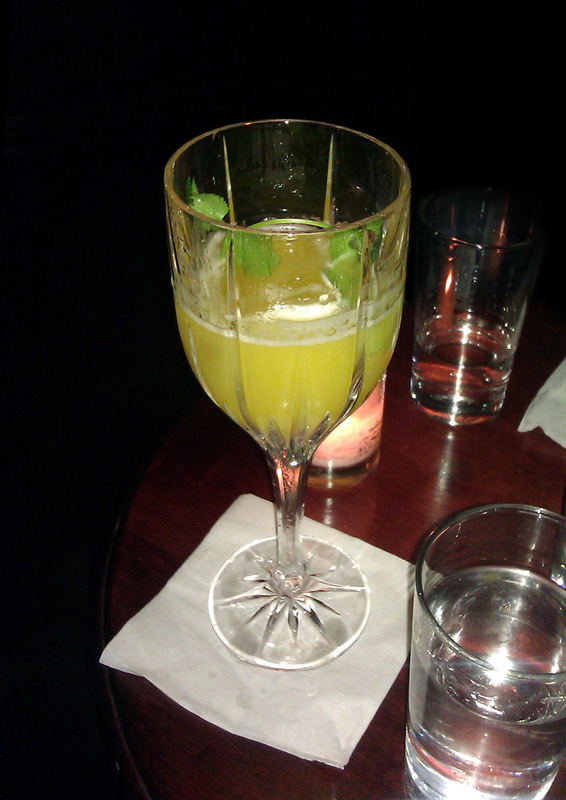 This was a reasonable drink, though not really up to the standards of some of the others. The combination of yuzu and matcha sounds very appealing, but in practice I found the flavor to be muddy, and I did not think that the matcha plus sherry combination was a home run. Perhaps I would need to drink it again to be sure. I have been wanting to experiment with matcha as a cocktail ingredient for a while, so this gave me a very nice baseline. The glassware, the service, and the decor were all world class, and the menu was the best I have ever seen in a craft bar. Angel’s Share, I applaud you for taking risks, and I congratulate you on your successes. Categories: excursions | Tags: alcohol, angel's share, bartending, booze, cocktail, cocktails, craft cocktails, drinking, drinks, mixed drinks, mixology, new york, NYC, spirits | Permalink.